It was in the high desert beneath the palm trees and engulfing art installations of Coachella that Cameron Bowman became a born-again festival-goer. While his first taste of music festivals was decades ago at Oakland’s now defunct Day on the Green, the rigors of a life in law diverted his focus to the service of justice. It wasn’t until 2011, when his now ex-girlfriend brought him to Coachella, that he realized how much the scene had evolved. Bowman, a criminal defense attorney at Valencia, Ippolito & Bowman (VIB) in San Jose, spends his weekdays working on cases that usually involve domestic violence and drug crimes — his specialty, according to his firm’s website. To the festival community, however, he is a legal sage who opens up dialogues that cover a wide array of topics ranging from what to do if a friend is overdosing to debunking legal myths (many of which, Bowman says, are derived from television and film). As he became more and more immersed within the festival community, he took note of the steady stream of legal questions he was asked, many of which shared a common theme. These festival-related inquiries often involved personal rights, drug laws and proper verbiage when interacting with police. Then, like a bolt of lightning, it struck him and he opened up his inbox to the festival community, encouraging them to ask him any and all of their legal curiosities with no subject being off-limits. Bowman’s resume is quite impressive, not just as an accomplished defense attorney but also as a guide, mentor and new perspective for the festival community. The furthest thing from one’s mind while attending a festival are the complex and sometimes cryptic nuances of the law. It is these nuances, with location and situation playing a role as well, that are frequently misconstrued; it is this misinterpretation of the law that can sometimes lead to trouble. Bowman, who is now a festival devotee, is on a mission to educate and elucidate, having given lectures and workshops at events like the International Music Festival Conference (now XLIVE) as well as at Lightning in a Bottle. Bowman’s lectures, such as his “Fest Law 101” talks at Lightning in a Bottle, have become highly regarded with people clamoring around him afterwards for a chance at meeting the Festival Lawyer. The gift of being a charismatic public speaker is not one with which we are all bestowed, but Bowman is certainly in possession of that quality—a quality that has most likely contributed to his success as a litigator as well. Writing a column for Everfest called “Ask The Festival Lawyer” which recently became a podcast, Bowman has found a way to utilize his knowledge to better serve the community he so cherishes. His wit and sense of humor is apparent in his work, making the topic of law more digestible and even entertaining. His practical applications are also useful outside of the festival sphere; the way in which he presents it has staying power, resonating in the minds of the many festival-goers who follow his work. The aforementioned Gumber experienced firsthand the reach that Bowman’s tips have had. As he and six passengers in a rideshare were on their way to Electric Forest in Michigan, they noticed several cars (that were decidedly approaching the same destination) pulled over by highway patrol. Not knowing that Gumber was a close friend of Bowman’s, one of the passengers cited Bowman's article “Ask the Festival Lawyer: How Do I Pass a Festival Roadblock?” in regards to the importance of never consenting to a search. Having attended an innumerable amount of festivals ranging from Iceland Airwaves to Lightning in a Bottle, which he boasts as his favorite (“Great vibes, great people, and the place where I did my first ‘Fest Law 101’ workshop”), Bowman is an example of the diversity of people and knowledge that these events attract. 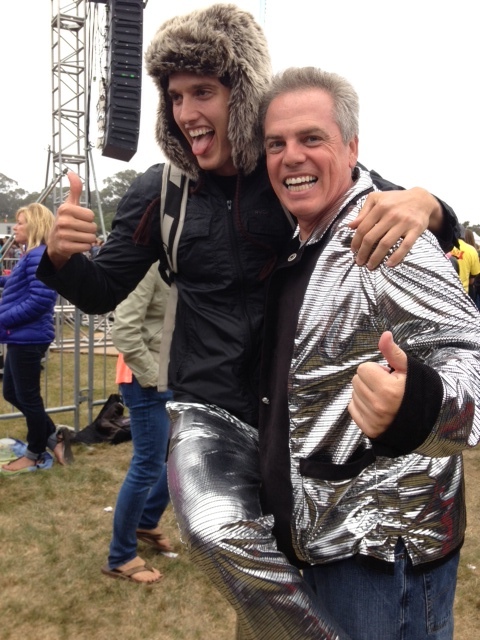 From dancing to Bob Moses with Armstrong at Symbiosis Gathering to helping Gumber get to Outside Lands one year (“he bought my ticket so I could go—that’s who Cameron Bowman is”), he gives back in ways to which anyone who has ever met him can attest.